Welcome back to Musician’s Corner. Each week, we bring you information on apps and accessories that are the bee’s knees for musicians and fans of music. Last week, we told you about a fun music theory app that lets you learn how to recognize pitch easier. Are you figuring out Mozart’s concertos just by playing by ear, now? Today, we want to let you know that one of our favorite music accessory makers, IK Multimedia, is releasing a new line of products this year. 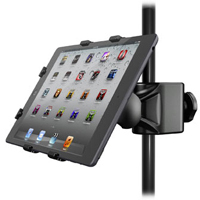 Their most popular iPad mount and stand have received an upgrade and are now ready for shipping. In 2010, IK Multimedia launched the iKlip, an iPad holder that mounts directly onto a microphone stand. In March of 2012, the company launched the sturdy and mobile iKlip Studio, which I still use as my main iPad stand to this day. Now, the makers of the iRig, the iRig Mic, and so many musical accessories it will make your head spin, have announced the launch of the second-generation iKlip, as well as a smaller iKlip Studio dedicated to the iPad mini. The iKlip 2 is a stage mount for your iPad. It connects to a microphone stand so that you can clip your tablet right in front of you for hands-free viewing while you are playing an instrument, or belting out vocals. The mount is made from sturdy plastic and features a ball joint so you can move your tablet into practically any position. It is compatible with any stand up to 1.2 inches in diameter. The mount clamps onto the stand using a tightening screw so you have plenty of flexibility and the screw threads on top are free to be used for the microphone. Thanks to the ball joint connection, users can reposition the iPad in almost any direction and viewing angle just by rotating the tablet. This makes the iKlip 2 the most versatile iPad mount on the market for stage musicians. The iKlip 2 is available for the 9.7-inch iPad as well as the iPad mini. Both are available today from the company’s website for $39.99 each. 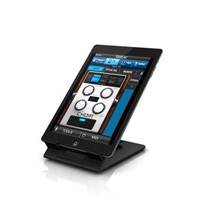 IK Multimedia also announced that their popular tabletop stand is now available for the iPad mini. 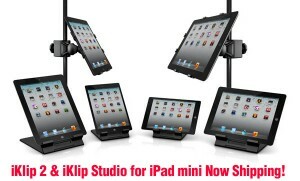 The iKlip Studio is a sturdy, yet lightweight, stand that is perfectly engineered for active use of the iPad. I reviewed the iKlip Studio in March of 2012 and found it to be remarkably durable for its size and weight. The stand is designed to keep your iPad from moving around too much, even when you are aggressively tapping away at your drumming apps. The iKlip Studio is my main iPad stand. The only time it is not set up on my desktop is when I am reviewing another stand and have to set it to the side temporarily. Even if you aren’t a musician, the iKlip Studio is ideal for every day use because of its sturdiness and flexibility. You can fold it in half and slip it into a side pouch, or even the inside pocket of a notebook folder. The iKlip Studio for iPad mini is the perfect fit for Apple’s smaller tablet. It also works well with most Android tables, including 10-inch devices. So, even if you switch tablets, you don’t have to get a new stand. The iKlip Studio for iPad and iPad mini are both available for $29.99. You can purchase them from the company’s website today. Check out the video below of the iKlip 2. Click here for a direct link to YouTube if you are having trouble seeing the video. 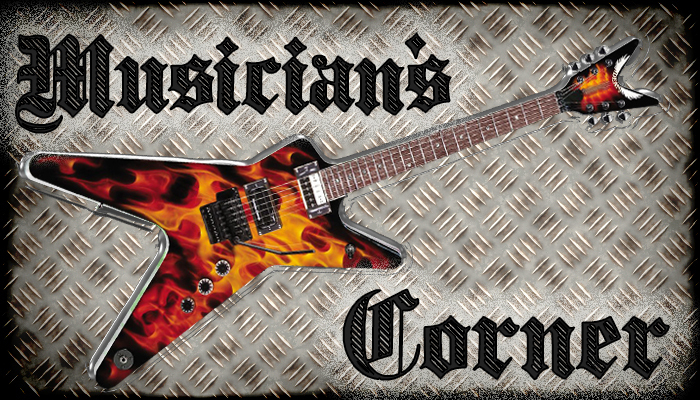 http://youtu.be/fShHA63nY2Q Thanks for stopping by Musician’s Corner. If you have any suggestions for apps or accessories you think we should feature, just drop me a line or leave a comment below. This week’s question: Where do you keep your tablet when you are performing on stage?